Site: Grow Calendula in a fine loam in a sunny area. Calendula like rich, well-drained soil, but are very tolerant of average to slightly poor soils. Improving your soil quality will produce much healthier plants and flowers, so add plenty of compost. Add a general purpose fertilizer once a month. Growing: Once your Calendula is established, it should grow well, even if left unattended. Water during dry periods, once or twice per week. Add mulch around the plants to keep weeds down. Early in the summer, the plants will begin to produce large flowers on long stems and will continue to produce flowers even after the first light frost. Calendula is a somewhat hardy. It will not be harmed by a light frost either in the spring or fall. It will succumb to heavy frosts or freezes though. Harvesting: As you pick the flowers for indoor arrangements, look carefully on the stem and the undersides of the leaves for aphids. Pick dead blooms to keep the plants neat looking and to encourage new blooms. 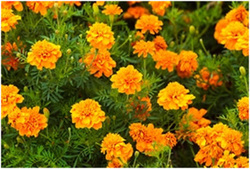 Pick flowers when open and leaves when young. Culinary Uses: Use petals lavishly to give saffron color and a light tangy flavor (not saffron flavor) to rice, fish and meat soups, soft cheese, yogurt, butter, omelets, milk dishes, cakes and sweet breads. Add 1 teaspoon petals to fish and venison. Garnish meat platters, pate and fruit salad.